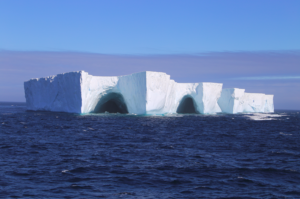 Look at this beautiful iceberg that we passed during our transect to Dronning Maud Land! In Antarctica, icebergs of very different size and shape calve off ice shelves or marine terminating glaciers frequently. Did you know that the largest iceberg that has ever calved off was 11000 km² big? 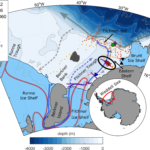 It is called B15 and broke off the Ross Ice Shelf in 2000. More recently in July 2017, the iceberg A68 with 5800 km² disintegrated from Larsen C in the Antarctic Peninsula. In the Figure below you can see that icebergs from the Antarctic Peninsula drift northward and enter the Antarctic Circumpolar Current –entering our track to Dronning Maud Land. 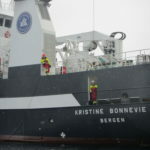 Observing icebergs and their drift trajectories on satellites is important to avoid collisions with ships, but scientists also study them because they interact with the surrounding ocean and influence the ecosystem. 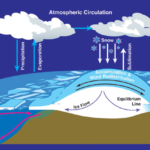 Surface winds push sea ice towards the iceberg on one side and away from them on the lee side, where a so-called polynya (ice-free area) develops. This has a strong influence on biological productivity and ventilation of the ocean. 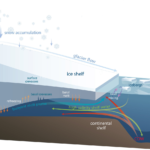 In addition, iceberg melt increases phytoplankton growth and sea ice growth due to the strengthened stratification. Very big icebergs such as B15 and A68 are studied because they destabilize the grounded ice and accelerate ice loss into the ocean. Why do they break off in the first place, what do they do to the grounded ice? Also, how does the underlying ecosystem react to the sudden income of sunlight after many centuries of darkness? 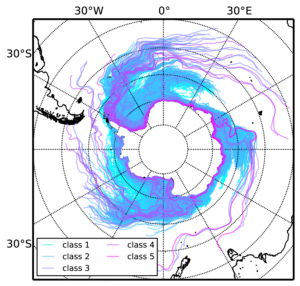 All these questions are important for the Southern Ocean, but very little studied. 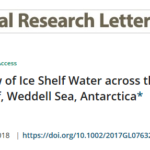 It is not our aim to study the impact of icebergs, but we still need knowledge about it, because the icebergs have such a big influence on the surrounding water.